K-cups are a great alternative for most single-serving coffee makers which comes with inbuilt filters. If you want to save time in making coffee and do not want to make the process of brewing coffee messy for yourself when you get small coffee breaks in office or studio, K-cups can become a lifesaver. Just because you do not have a Keurig around does not mean you cannot brew coffee. 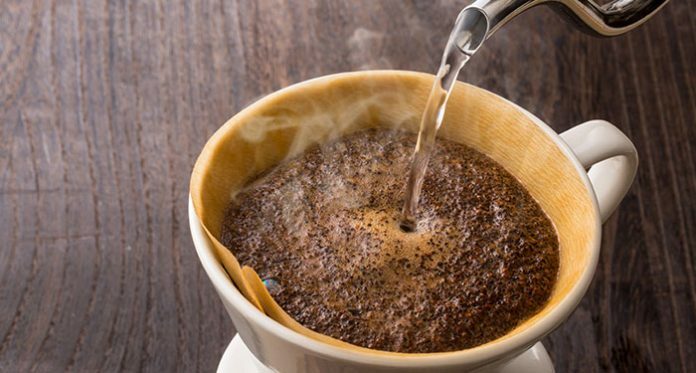 In this article, we share with you some easy methods on brewing coffee easily with a K-cup even when you do not have a Keurig around so that your coffee sipping moments are not compromised. This method could be time-consuming and get messy for you if you do not use the right technique but in the careful handling of it, we assure you a smooth brewing experience to get your coffee right. First of all, remove the foil over the K-cup and put the coffee grounds into the coffee mug from the K-cup. Hereafter, cut the base of your K-cup in a way that it can hollow up the cup to provide the right passage for your coffee flow. However be careful in not piercing out the filter of the K-cup. You can now fill up the coffee mug that contains the coffee grounds with hot water and let the mixture to sit for the next few minutes. Now by holding the top of the K-cup, pour the coffee mix in the other cup in order to remove the coffee grounds from your coffee, or else your coffee will become too strong. Hereafter you can add thick milk or even Cremer to add some flavour to your coffee if you want. This is an easy method and won’t even take much of your time. It is a traditional style of brewing coffee that is still used in a lot of remote places, and the best part is that it is mess-free. Remove the foil above your K-cup and put the coffee grounds from the K-cup in the filters. You could choose to blend more than one flavour of coffee grounds if you want to give a unique taste to your coffee. If you do not have a coffee filter, you could also choose to use a towel in lieu of it. Twist the top of the coffee filter tightly in order to keep the coffee in the filter well. This is done to ensure that the coffee does not become compact when you pour hot water over it and so that the coffee grounds can freely move inside the bag. Now tightly string up the coffee filter to close the bag and make sure that the length of the string is enough to leave it hanging outside the coffee mug. Now add some hot water in the coffee mug and put the coffee bag inside it and let it rest for the next 4-5 minutes depending on how strong you want your coffee to be. Discard the coffee filter now and add milk or creamer to add flavour to the coffee if you want and your coffee is ready now. You could also use a French Press coffee maker for the purpose of brewing coffee easily in case you do not have a Keurig. French Press might seem like fancy to you but it is one of the best machines to brew coffee that comes in great price and elegant shapes, and it is something that you can carry with you in your office as well as when you are traveling.